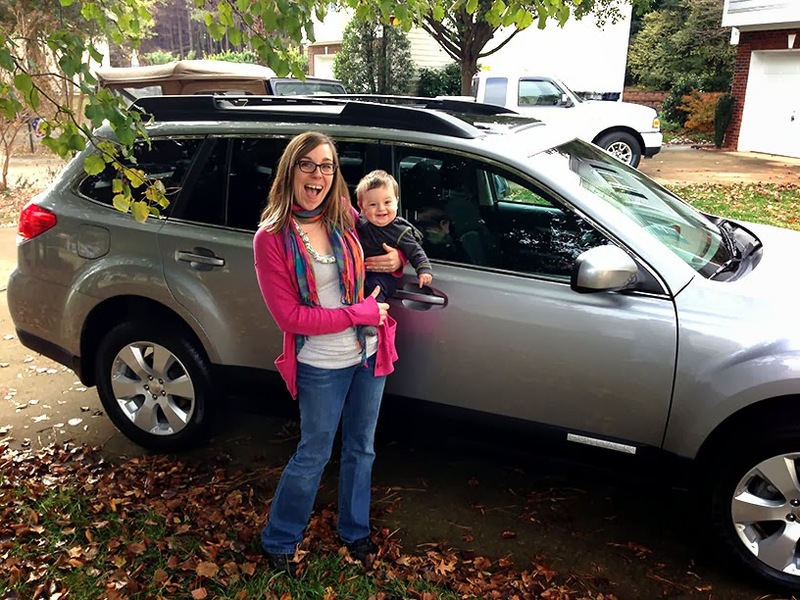 Hello Sprout: Our New Family Car! Meet the newest member of our family! We got a 2011 Subaru Outback! Rob and I had been talking about getting a new car for a few months now. While the Cube was great, it wasn't ideal for humans, dogs and any extras like luggage. We also felt that we should sell the MINI since it was just sitting in the garage and we didn't need three cars. We're going up to New York soon and with the long drive and the possibility of driving in crappy weather, I thought it'd be a good time to see if we can get a new car. Of course I wanted a Subaru because it's a very safe car, the all wheel drive and the room. We started the search for either a Outback or Forrester. You know what? It's pretty hard to find! Sure there are used cars, but they are either old and high mileage or new and really expensive. The one we ended up getting is fairly new, but it does have a lot of miles. The price was really good though! Also, this car is LOADED! We have heated seats, defogging and deicing, touch screen radio/cd play/gps/ blue tooth/ ipod..., sun roof, tinted windows, all weather matts and who know what else? It looks like the previous owner did a lot of driving, like a sales rep. Score for us! With our trades in and a slightly longer loan, we are actually saving quite of bit of money too!